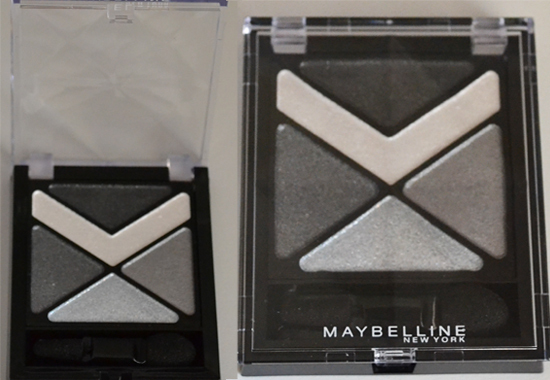 Another great Maybelline eyeshadow palette, this time in simple variations of grey, black and white. I decided to buy this product because I don't really have a Maybelline shadow set that's just dedicated to these kind of charcoal shades, and so I'm hoping this will provide a good colour palette for a basic smoky eye. 5 Shades: Black, white, and a medium, light and dark grey. All colours are shimmer tones. Comes with a small sponge applicator, with one end thick and the other thin. A good range of charcoal hues that allows light and shade. Good pigmentation for most colours. It lives up to its 'Hyper Diamonds' name, as each shade shimmers beautifully. Lovely packaging, especially the shapes of each shadow. There are only four sides of the sponge applicator, but 5 shadows. The white and light grey colours are almost transparent, so these can really only be used as highlights. Arr I wanted to buy this but because of my skin tone the lady told me to go for something else because apparently some of the shades act as highlighters.. and you've repeated it here. I do love it though! Nice post and I really like your review! Your blog is awesome! I love finding great beauty products that are so affordable, great pick! These colors seem like they would all compliment each other so beautifully for a smokey eye. Also, I really appreciate you giving the pros and cons of the product- its definitely important to know as much as possible! This a pretty shade! I love gray eye shadow. Thanks for commenting on my blog, I'm following you back now. I wear a LOT of gray, and I really need a gray eyeshadow. This is so gorgeous, I may consider getting it. Great details about Cubic Zirconia. I'm Celine, a student journalist and fashion blogger. I love writing, reading, daydreaming and fashion.